Do you want to build a snowman? 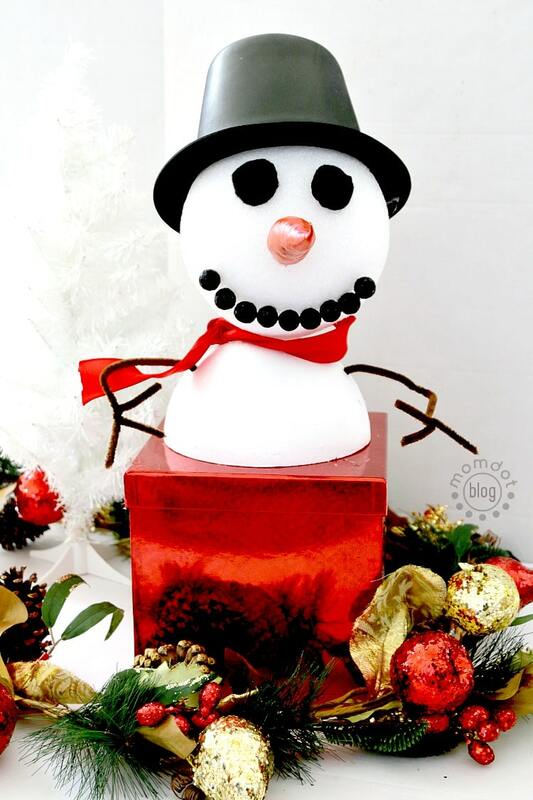 Snowman Giftbox that is! I know better than anyone that when gifting great presents, they are not always easy to wrap the traditional way. Sure, you can scotch tape it to death if you want, but then it runs the risk of tearing before the big deal. And while I love the ease of tossing presents in a gift bag, the mystery and thrill of a present under the tree is kinda gone. Now I don’t know what you are gifting this year, but beauty and health is always in style. And right now you can pick up great holiday gift packs in favorite brands like Axe, Dove, and Caress. These gifts are fantastic as they are thoughtful, useful, and perfect for nearly any age or any person! What I love about holiday gift packs that include bathroom items is that while practical, can also be super fun from the college student stocking up to the husband hitting the gym every day that doesn’t want to stink on his way back to work. And even tough you are gifting a thoughtful gift doesn’t mean you have to throw it in a basic bag! 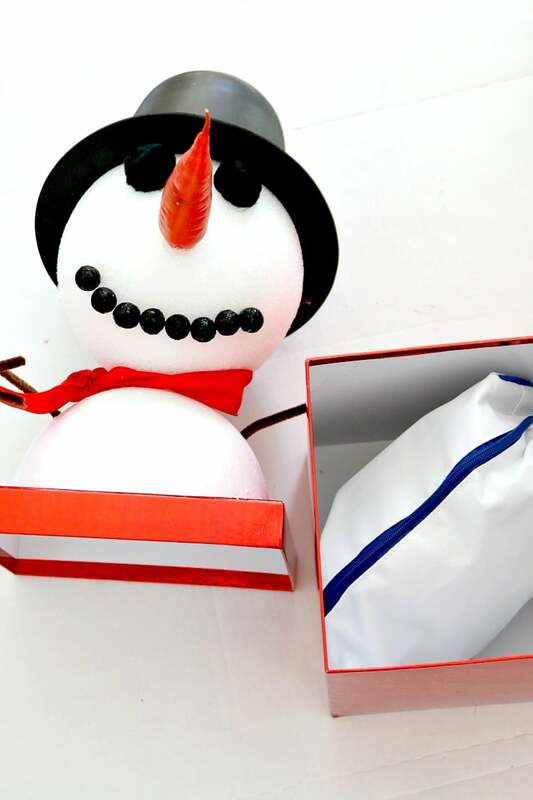 Kick up the gift giving with this easy and fun tutorial on how to turn a plain box into a snowman, delighting everyone with this under the tree adorableness. Featured in this article is also one of my favorite brands, Dove, to showcase how easy it is to wrap up oddly shaped presents into fun, fabulous gifts! This box is perfect to house oddly shaped presents that are hard to wrap like Walmart Holiday Gift Packs! Tis’ the season to give moisture. 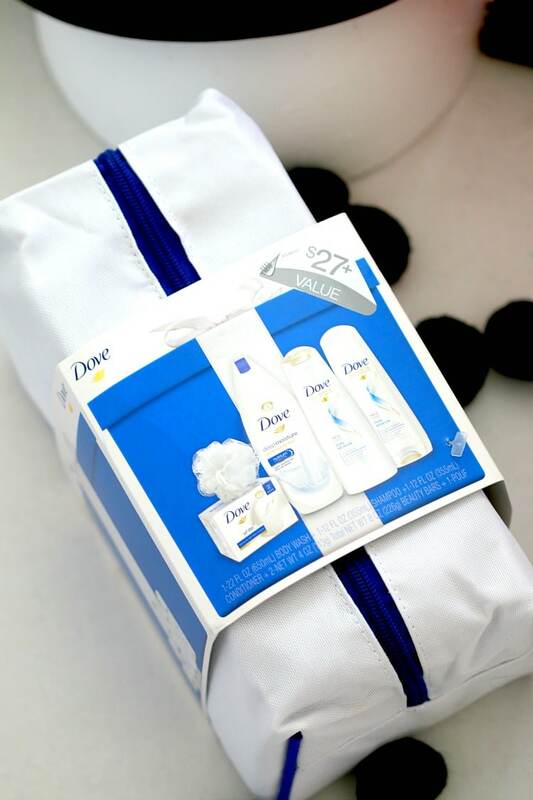 The 5-piece Dove Deep Moisture Gift Pack is the perfect gift for the holidays and contains everything needed to stay soft and smooth during the harsh winter months and it’s a great value. First remove the box lid. Then use your Styrofoam hot glue and glue your half circle styrofoam to the box. Once set, add your second styrofoam ball on top. Please note that the glue that you use for this type of material can take a few minutes to dry, so hold in place until secure. 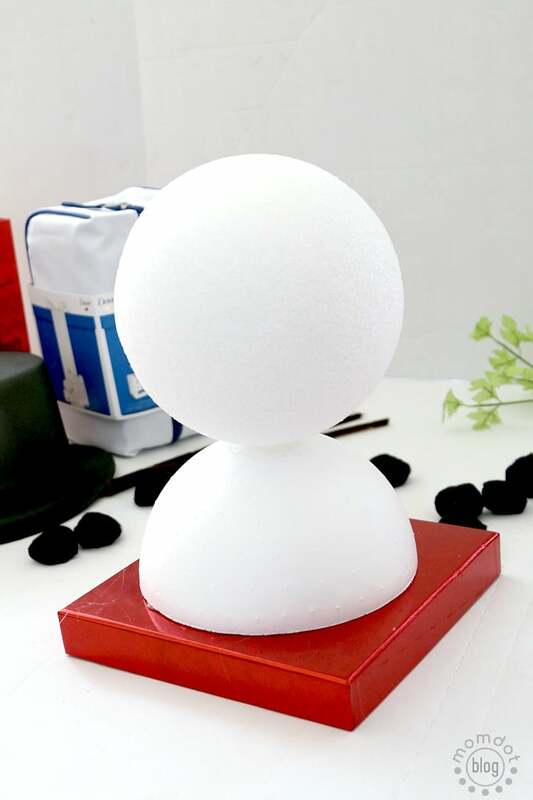 Now you can start adding on your materials to give your snowman a personality! 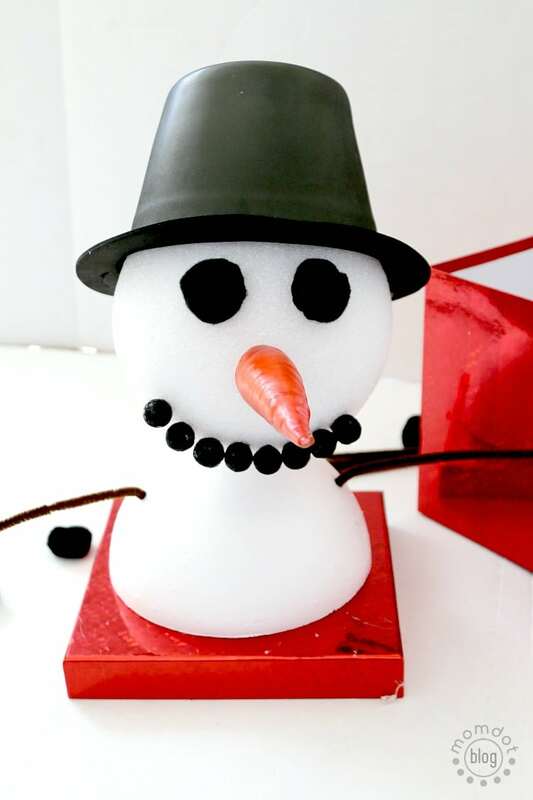 I added a little fun foam snowman hat, black cotton balls for eyes and mouth and even found a fake carrot nose to glue on. Next I added a red ribbon for his “scarf.” Lastly, I poked brown pipe cleaners into the foam for arms. The arms are so cute and can hold a tag with your recipients name as well. This tutorial has been brought to you in partnership with Lunchbox PR. This year, gift the gift of style with gift packs that will keep everyone on your list looking and feeling good. Walmart has a wide range of gift packs from some of your favorite brands like AXE, Dove, and Caress at prices you’ll love. Unwrap the joy of freshness this holiday season with a great gift pack. Spread inner peace this holiday season with the AXE Harmony gift pack, featuring a calming and sophisticated fragrance with a masculine mix of citrus, pepper and ginger. This 4-piece gift pack contains everything a man needs to smell their best throughout the day. • Shower Detailer tool in a stylish, gray toiletry bag. Deck the halls with freshness this holiday season. The AXE Apollo Gift Pack features a classically masculine and sophisticated fragrance with an addictive fresh combination of crisp notes of sparkling fruits, sage with a creamy, musky background. The AXE Anarchy Gift Pack is for the naughty or nice. This attention-grabbing fragrance is so exciting it will unleash the inner anarchist in everyone. It features a rich, spicy scent that combines fresh and fruity notes and sweet woods, such as sandalwood and white amber. • 4 oz AXE Anarchy Daily Fragrance Body Spray in a stylish toiletry bag. Every guy has looking good on their list. For those dreaming of a stylish holiday, the AXE Phoenix 4-piece gift pack is the perfect present. It features a classic, fruity fragrance with a blend of lavender, geranium, citrus, and coumarone. • 4 oz Daily Fragrance Body Spray all in a stylish toiletry bag. Unwrap freshness for the holidays with this 5-piece gift pack that has everything a man needs to look his best. Wherever he goes he’ll be feeling great with the best care for his face, body, and hair.